40255 Palmetto Drive, Palmdale, CA.| MLS# SR19081412 | Southern California Homes for Sale. Search properties Southern California. HUD Home. 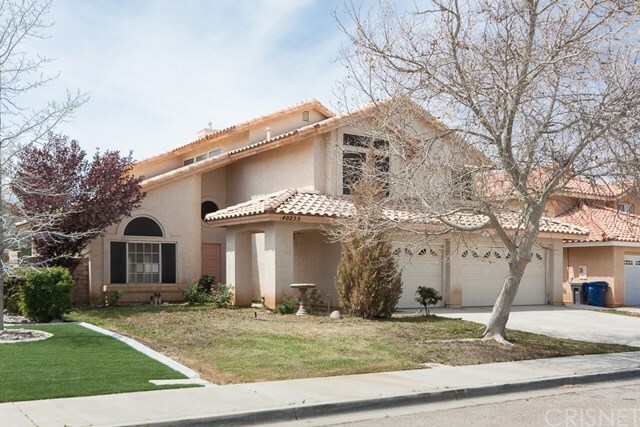 Located in the heart of Rancho Vista, this westside Palmdale two-story home features nearly 2900 square feet of comfortable living space along with a 3-car pull-through garage. The tiled entry opens to the spacious living room and dining area. The large kitchen is well equipped with tile flooring and counters, built-in appliances including a double oven, lots of cabinets and a convenient island; the adjacent family room is ready for entertaining with a wet bar and a cozy fireplace. A downstairs bedroom and full bathroom and the laundry room complete the first story. Upstairs, the master retreat is ready for relaxing with another fireplace and spa-like private bath with dual sinks, garden tub and separate shower. Two more bedrooms and another full bath ensure ample living space. The backyard is securely enclosed with block walls and is sized for easy maintenance. Directions: From the 14 fwy, exit west on Rancho Vista Blvd. ; north on 30th St. West; west on Ave. O8; north on Palmetto to the property.